What will your Thanksgiving look like this year? Spending time with family and friends? Gorging on a potluck of food? Relaxing in the comfort and warmth of home? Well, not Eric Larsen. He’ll be heading to the South Pole in Antarctica freezing his acorns off during his Last South expedition. All alone. Why, you might ask? Well, it involves the small matters of saving the planet and making a connection with his kids. Eric Larsen’s South Pole expedition is his attempt to break the world speed record for a solo, unsupported ski trek to the South Pole in Antarctica. 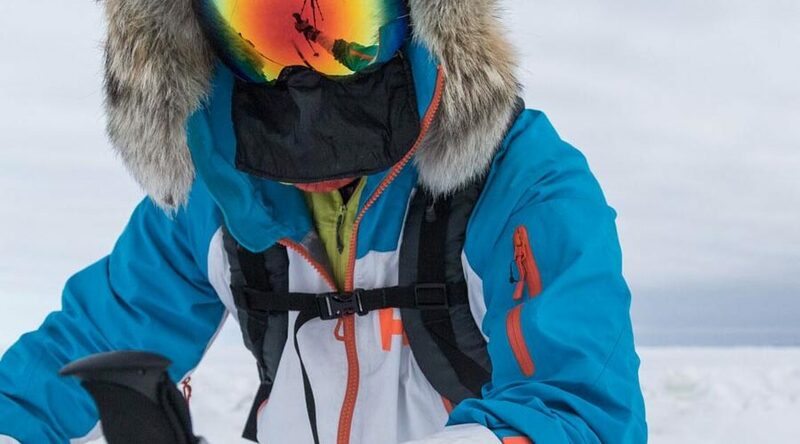 That’s 702 miles of skiing without any outside support, pulling a sled packed with 135 pounds of food and gear through relentless wind, over hidden crevasses, and into white-out conditions. Temperatures can drop to -20 degrees Fahrenheit this time of year. About 300 people have skied to the South Pole. Ever. Of those, only 19 have done it solo and unsupported. Larsen is determined to become the twentieth. Most people take 50 to 60 days to complete the epic trek from Hercules Inlet, on the edge of the frozen Antarctic continent, to the geographic South Pole. In 2011, Christian Eide of Norway rocked the world when he set the current speed record in just 24 days. 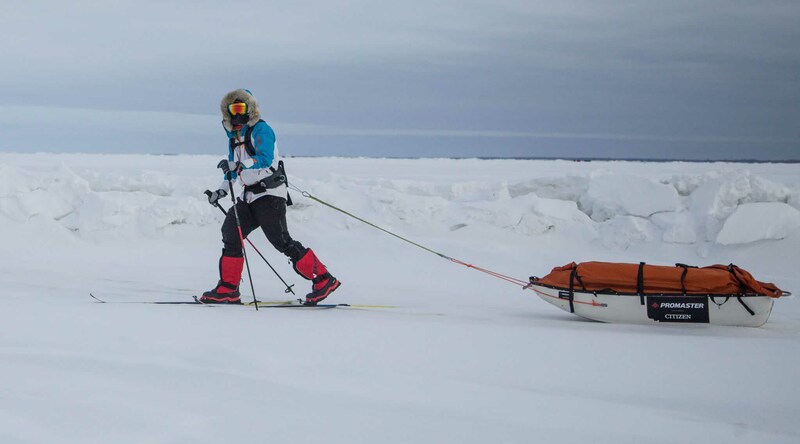 Larsen hopes to complete the solo South Pole journey in 22 days by skiing 12 to 14 hours per day. Larsen would become only the third person in history to complete the journey in less than 30 days. Impressive, right? But, why would anyone willingly subject themselves to all of this? Fame? Glory? Money? Nope. Nope. And definitely not. Eric Larsen hopes his Last South solo trek will raise awareness of climate change and the clear evidence he’s witnessed personally of the melting ice caps. Larsen has partnered with Protect Our Winters, a non-profit climate advocacy group whose mission is to bring the global snow sports community together to lead the fight against climate change. As fathers, we all experience the challenges of spending time away from our kids, whether it’s because of demands at the office or from our outdoor interests. 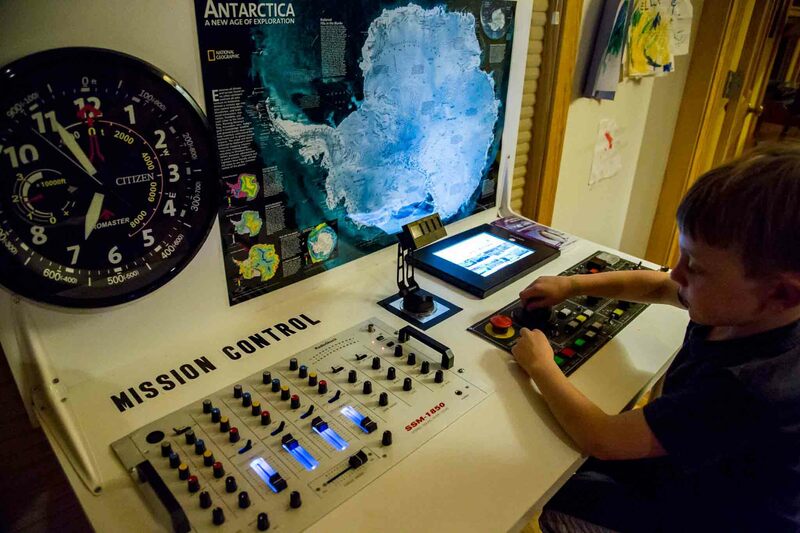 For Eric Larsen’s South Pole adventure, he’s devised a very clever way to engage his kids. To learn more about Larsen’s challenges balancing his outdoor endeavors and family responsibilities, I reached out to him while he was preparing for his Last South solo trek. How many hours a day do you train for your bigger expeditions? And how do you fit in family time with a rigorous training schedule? A lot of what I do for training is actual expeditions. Already this year, I’ve been gone for three months – Greenland, Arctic Svalbard and Canada… when I’m home I am also training – either riding my bike or hooking a harness up to a truck tire and pulling it around the back roads and trails of Crested Butte. Depending on the week, I’m usually out training 1-5 hours a day. Fitting in family time is tough even without the training. On any given day, I’m doing a variety of expedition-related tasks – both for my personal trips and guiding. There are never enough hours in the day so balancing all that with my family and training is tough. I try to do a lot of office work after they go to sleep which means I generally don’t get enough sleep. Do your outdoor adventures take you away from your family, and how does that make you feel? Pretty much all my adventures take me away from my family. As I mentioned, I’ve already been gone three months this year for various training trips, speaking engagements and guided expeditions. I’ve missed all of my daughter’s birthdays. I’ll be missing Thanksgiving with my family this year. I missed my son’s first Christmas. Being gone makes me feel terrible and lonely. What is the passion you have for the outdoors and why is it important for you to have your kids understand them? I have a huge passion for simply being outside – in whatever capacity. I find a lot of fulfillment and joy in the outdoors – and most, if not all, of my hobbies and interests, are outdoor-related. On a bigger level, I have this innate drive to do big expeditions in remote places. I like the physical and mental challenges of expedition travel and like the severe limits of extreme cold weather travel. I think it’s important for my kids to understand my passion so that they know what I am choosing to be gone and that it’s not me choosing a place over them. I want them to understand they will always be my priority but that I have found a purpose in life that drives and sustains me and by doing so, hopefully they will be able to find their own passion where ever it may lie. This is a little different question, but why is it important to you that your kids have a relationship with and respect the outdoors and nature? I think there a lot of valuable lessons that can be learned from being outside and in nature – from learning how to be curious or observant to learning how to be quiet and listen. I think being connected to nature is party of maintaining a healthy body and mind as well as a healthy planet. What kinds of outdoor activities do you usually do with your kids? We’re definitely an outside family and we are pretty lucky as we live in a place [Crested Butte, Colorado] with easy access to vast amounts of outdoor activities. We’re outside as much as we can be from hiking and biking to skiing… fishing, mountain climbing… We do a lot of camping as well as just simply poking around different areas. Right now, I also like to just go out and let my kids explore on their own (while I keep track of them from a watchful distance). Do you think spending time outdoors with your kids makes them better people? I think there are a lot of valuable lessons that can be learned from being outdoors. As young kids, being outside allows them to foster their own curiosity and follow their own interests without me getting in the way. I think this lets them build confidence and self reliance. We also go to a lot of places just to hang out – river, beach, lake, field, whatever… where they can be invent their own games and foster their creativity. I also think that we are better people when we are connected to the outdoors and ultimately, the quality of our lives is directly connected to the quality of our environment. Do you think spending time outdoors with your kids makes your family stronger? Most definitely. My wife, Maria, and I talk about it all the time. We took a family road trip to Moab this fall. As a family, it was one of our most memorable and positive experiences. When we’re outside, we get to remove ourselves from the distractions of our daily lives and really focus on each other and enjoy one another’s company. You can follow Eric Larsen’s Last South solo trek here and watch his daily progress on this map of Antarctica. Previous Previous 20 Best Camping Games For Kids… Illustrated!